Why some patients respond to immune therapy- and others unfortunately don't. in a disease previously infamously famous for its poor prognosis once the cancer has spread. Unfortunately, not all Melanoma patients respond to immune therapy and finding out why- and how to change that- is one of the big next challenges for anyone in Melanoma. 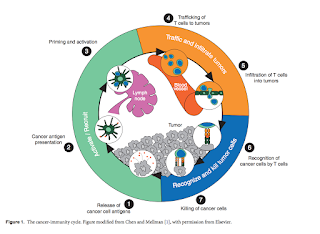 This is now an interesting article (free pdf under the link) by Kim and Chen on why some patients respond to PD1/ PDL1 blockage and others don't. And then go through what can go wrong at each of these 7 steps. You can listen to a really good comment on that paper by David Kerr here . 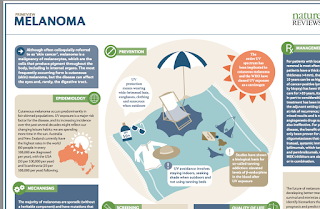 A MUST- READ 2015 primer for anyone with interest in Melanoma! Figure 1 shows the incidence of Melanoma, so how many patients are diagnosed with Melanoma in a given country. The numbers come from Globocan 2012- please check it out, it is a very good data source from the World Health Organisation! 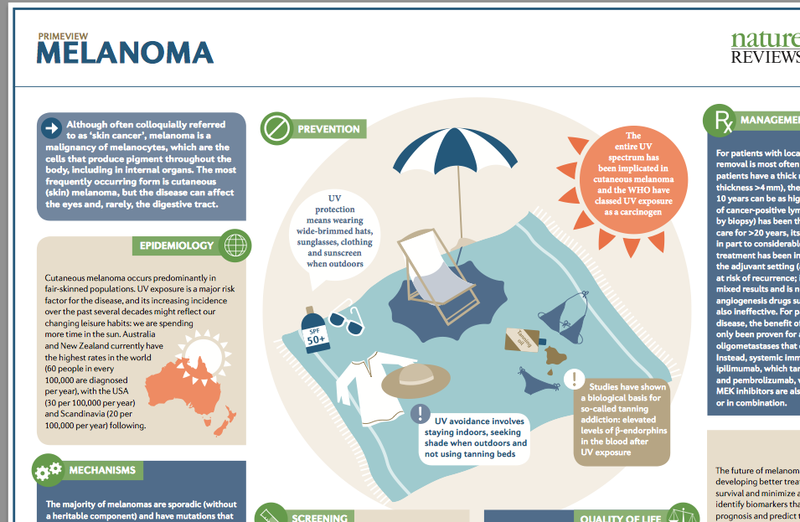 If you don't register your Melanoma cases, you don't have a Melanoma problem! Table 2 gives compares the results of the latest drugs in Melanoma- very useful! IMPORTANT-Please note that foot notes 'results confounded by cross-over'- so Dacarbazine has NOT gotten any more efficient over time, it is just that patients who (not very surprisingly) did not respond to Dacarbazine crossed over to the other treatment arm and therefore lived longer than on Dacarbazine alone. Even without cross-over, patients who progress on a clinical trial can leave the trial and move on to other treatments- as patient interest is obviously to survive as long as possible- but this can make the trial treatments better than they actually are! And we are obviously keen on the Ipi plus Nivo results in comparison! Table 3 for BRAF mutated Melanoma: there should be no doubt left that the combination of a BRAF and a MEK inhibitor is better than a BRAF inhibitor alone! Should your oncologist STILL disagree, this would be a paper- including the supporting studies, references at the end of the paper- to take to him or her to scientifically argue your case. On the primer in pdf- a really beautiful summary of the article in a practical format. Just one point- why the 'subjective' perception in the Quality of Life section?! We should get out of this 'objective' versus 'subjective' (suggesting lower quality of the latter) and rather focus on how to solidly capture and analyze this type of data in a way that fits its nature. Quality of Life IS subjective by definition- just like e.g. pain is- which does not mean that one can not objectively measure and analyze the impact of a treatment on the quality of life in groups of patients. It is not that 'objective' measures in clinical trials are not open for debate- as just discussed above, even the 'very hard' factor of overall survival is influenced by outside circumstances, so blindly trusting this 'objective' data could be down-right dangerous. Because in the end, patients need life in quality- anything else would be extended suffering. and welcome to this new MPNE journal club! The MPNE ASCO 2014 blog created a much larger than expected (well, than I expected) interest and I thought it might be helpful to have our discussions around interesting results for Melanoma in one place, with the option to go back to older threads for reference. The aim of this blog will be to present relevant and trust-worthy scientific information in an understandable way for Melanoma patients, with reference to the original source. Should something remain unclear, please do ask!